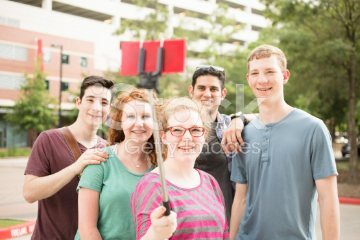 We recently braved the summer heat to snap quite a few frames of a group of young adults enjoying the city life. The friends enjoyed the outdoors together and were sure to capture the moment by taking a few selfies using a selfie stick. During the downtown shoot, they portrayed both tourists and friends hanging out using various forms of technology. To view more images from this shoot as well as many more shots of our "friends in the city" photographs, click the link below. To view or download the image above, just give it a click!